Arctic Dolphin Hector RTA Tank has unique design with Stainless Steel body and Pyrex Glass tube. This is an innovative tank with 24mm diameter and 3.5ml e-juice capacity which can satisfy the daily vaping. The new type tank from the brand Arctic, Dolphin Hector RTA Tank has unique design with Stainless Steel body and Pyrex Glass tube. This is an innovative tank with 24mm diameter and 3.5ml e-juice capacity which can satisfy the daily vaping. It is an easy to use device featured top filling and adjustable airflow control to avoid oil leakage and remove heat of above 60%. Arctic Dolphin Hector RTA offers a perfect exemplary design that you will get amazing vapor clouds with it. • more convenient to clear condensed fluid. 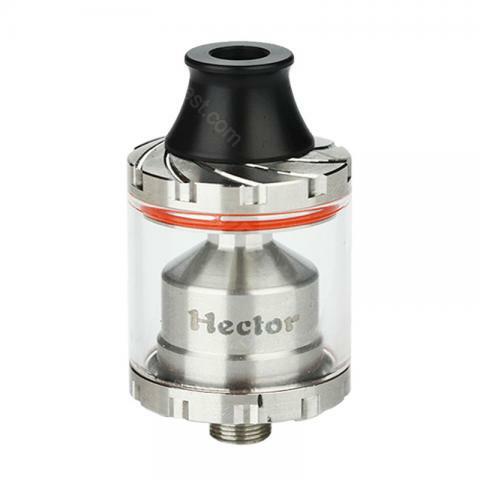 Hector RTA by Arctic Dolphin The Hector is a 24 mm speed dome RTA with a capacity of 3.5 ml. It uses the lower air flow without air flow control and can be filled up. Good, small, good looks look good flavor than it's hard to find the right resistances for it. The resistors have to be low voltage somewhere at 0.40ohm, being small, it's getting hot enough. A minus is the flow of air that can not be adjusted, but it's enough for me. They could put in the box two ready-made resistances but at a very low price you can not ask for more. Comes very nicely packed in a well-finished tin box with a semi-transparent, even very stylish package. The very comfortable butterfly. It works well It does not flow Currently it feeds well The air is quite not noisy, the aroma has a good word. The air enters the bottom of the deck through some small bumps that lift it out of the way, so the air can move between the way and its base. It is provided with an anti-condensation / leakage plate, so do not worry about leaking juice. Hector RTA gives a fairly restrictive air of the lungs and Draw is also fairly smooth, with no whistle or turbulence. Performance is surprisingly good. I like how flavor feels, but I'm a fan of limited lungs, so it's pretty subjective. Pro: Very accessible Good aroma Smooth equality Looks good Fill in light Well built Higher quality materials Versus: There is no airflow control It does not have the capacity to air or twist to exceed 55 watts. Size: 24mm x 42mm Capacity: 3.5ml Material: Pyrex Glass + Stainless Steel Thread: 510 Thread • The shortest and cheapest RTA in the world • Simple and fashion design • Mini size with large capacity - 3.5ml • Bottom Airflow • Velocity Build deck • Easy top filling • 304 stainless steel material • Heat dissipation up to 60% • Adjustable electrodes • Magic Accessories (Insulation gasket + O-ring) • prevent atomizer from scratching your mod; • prevent condensed fluid from flowing into your mod; • More convenient to clear condensed fluid. • 1 x Hector RTA • 2 x Set o-rings • 4 x Screws • 1 x Insulating gasket My order arrived quickly and safely thank BuyBest! Arctic Dolphin Hector RTA Tank, good Flavor, and i like its design! Sehr schneller versand. Einfache Bedienung. Auch Arctic Dolphin Hector ist sehr schön als ZigarettenSchachtel verkleidet die einzelnen Geschmacksrichtungen drin, mit zwei Akkus erleichtert das weiter rauchen.